1. 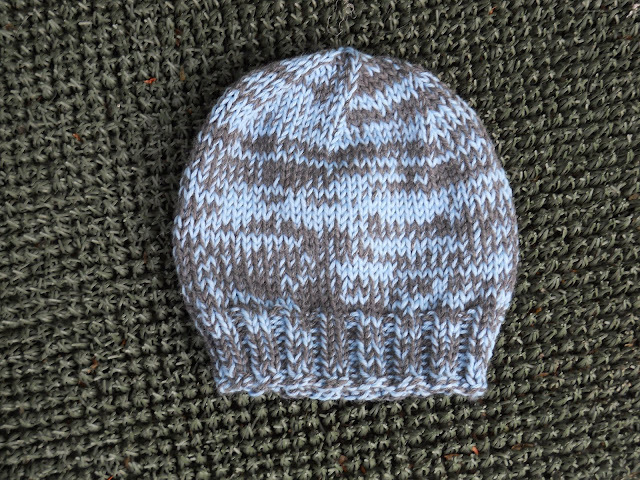 Cap is worked with two strands of yarn throughout. 2. Can knit two caps with one skein Paton’s Classic held w/ LB Fisherman’s. With 10.5 circular needle cast on 68 sts. Join and work in the round. Should be about 2 inches from cast on edge. Knit even until cap is about 6.5 inches from cast on edge. Finish: Cut yarn leaving 6 inch tails. Use tapestry needle to run yarn tails through the stitches and pull to close. With 10.5 circular needle cast on 64 sts. Join and work in the round. Should be about 1.5 inches from cast on edge. Knit even until cap is about 5 inches from cast on edge.